Gold JJ Tapestry. Size 24 Gold  - $4.20 : Yarn Tree, Your wholesale source for cross stitch supplies. Item 3289. 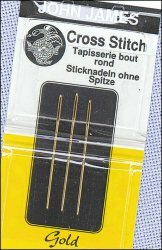 Size 24 Gold John James Tapestry Needles. Gold plated needles from John James. Three needles per card. Priced per card. Please order by the number of cards. Opalescent White Lugana 28ct Short Cut 9" x 55"
Dirty Linen Cashel Linen Short Cut 21.5"x55"